If you are ordering name labels to attach to your elderly loved ones’ clothing in a nursing home or independent living facility, you should include their name in large, easy-to-read letters, but you should also include their room number. While someone may be able to look up their room number based on their name, it will be easier for everyone if it is listed underneath their name. If you own a small company and want labels to help brand your clothing items, make sure you include your company name and your company website, at the very least. This information will help people find you later or will help them spread your brand name if people compliment their garments. 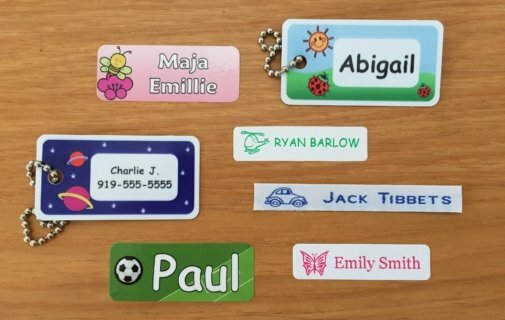 If you need labels for your children’s clothes, you may want to consider including a fun symbol that they like, so they see the labels as fun, instead of embarrassing. For example, if your child likes soccer, put a soccer ball next to their name. If you are ordering sew in labels for your knitted items, you can make them more fun by including balls of yarn or small notes, like Love Grandma or Mom, so that your loved ones will think of you fondly when they see the label. You can also include a date, so your loved ones remember the occasion when you gave them the gift.